That's perfect. Thanks for your help. Have you been impressed with someone’s performance or want to help out a friend? Then a personal letter of recommendation is what you need. Usually, a personal recommendation letter is done for a variety of reasons. One reason is that you may write a personal letter of recommendation for a person wanting to join a certain company. Vouching for someone especially if one is in a higher position shows that the person is highly recommended. In some cases, a personal letter of recommendation for a friend is done not just for employment purposes. Your friend might be longing to join an exclusive club or organization and having several personal letters of recommendation would give the boost your friend needs to be able to join. Another reason why a personal letter of recommendation may be needed is when a big purchase is done such as when a close friend takes out a house or car loan. To ensure that the person is financially capable, companies would need references to speak to. For fresh graduates without job experience, teachers are often asked to make a personal recommendation letter to prove their standing in the class. As someone writing a personal letter of recommendation, it is essential that you fully know the person that you are recommending. As much as possible, there should be relevant experience being with that person such as working with them in a previous organization or being a member of the same organization. Personal letters of recommendation should highlight the strengths of the person. As the letter is also a reflection of you, one must ensure that data is accurate and true. You must be able to state the relationship to the person and be able to answer questions if there are follow up inquiries about the recommended person. Writing a personal letter of recommendation is one thing you should not miss out on our online portal. This will enable you to get a recommendation that will see you through whatever you are applying for. Get to serious business by starting to write a personal letter of recommendation with us. If you have not written a letter of recommendation before, the process can seem a bit intimidating. Fortunately, our professional letter writing service is here to sort you out. Utilize us while you can here on our online portal. Writing a personal letter of recommendation may seem to be a daunting task at first but it’s not. Ask the purpose of recommendation. To start with, you must be aware of why you are creating a personal letter of recommendation. Is it because of job employment or for loan purposes? Knowing the purpose will give you an idea of what your friend will need. Decide whether you will commit a personal letter of recommendation for a friend. After knowing the purpose, you must decide if you will commit to writing a personal letter of recommendation. Always keep in mind that you are vouching for someone so you must know that person well. List down the capabilities of the person. Once you have decided to give a personal recommendation letter, think and list the capabilities of the person. This would help you in noting down the strengths of your friend and how you can best emphasize it. Ask for samples of personal letters of recommendation. Getting hold of such samples will let you know commonly used formats and what is included in such kind of letter. It would be better if the friend asking for recommendation can provide a past personal letter of recommendation. If in doubt, ask. If there are clarifications such as the length of time you have worked with, get the answer to ensuring you are on the same page with your friend. The first step when you are writing a personal letter of recommendation, target the recommendation. Is it for an academic post, job, a volunteer position, a background check, or a personal reference? Write your letter so that it is focused on this purpose. Let your personal letter of recommendation be customized. Familiarize yourself with the position. Get a copy of the job description, if you can, and talk to the person you will recommend. Address the recipient. As you are writing the personal letter of recommendation for a friend, ensure that you have addressed the correct recipient by double checking with your friend. State the purpose of the personal recommendation letter. In a brief but concise way, start with letting the recipient know why you are writing such a letter. This would help in knowing the purpose of the letter early on which is your personal letter of recommendation for a friend. State what you are recommending the person for. There can be different reasons for personal letters of recommendation such as recommended for a job opening, a loan or membership to an exclusive organization. Identify the nature of your relationship. This part will show the relevance of your personal letter of recommendation. A supervisor giving a good recommendation to a subordinate will bring strong points to a background check. However, if the nature of the relationship is more of the same level colleague or lower than it might not bring as much strength. Show how long you have known the person. Recommending someone that you have known for only a short time may bring you limited information on the person’s capabilities. List down the person’s recommendable traits. 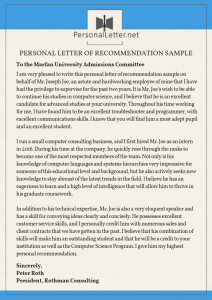 One of the most important aspects of a personal recommendation letter is the recommendation itself. The items that you have prepared will now be put into writing at this time. Think of how you can write the personal letter of recommendation for a friend in a way that his/her strengths are emphasized. Be open for a follow-up. Leave contact details in case follow up is needed. Personal recommendation letter writing will be smooth with our tips handy. Inform yourself about the person you are recommending. Spend some time talking to them about their goals and the position they are applying for. Gather together their current resumes, and memos or notes you may have on them and any other information that will help you as you write the letter. In writing a personal letter of recommendation, here are several tips to take note of. Keep it short but sweet: although highlighting all of your friend’s accomplishments in a personal letter of recommendation is something you would like to do, it may somehow backfire on you. Most recipients are busy people and opening a lengthy personal recommendation letter may seem like a chore to them. Worse, it might get ignored. Be direct to the point but add a sweet, personal touch. Make time to discuss with your friend / former colleague: personal letters of recommendation for colleagues from way back may lead to inaccurate data. It may be something such as including a skill that your friend does not possess or giving inaccurate dates for the length of time you have worked together. State a specific story of a successful project: it is not enough that you list down strengths and skills in a personal letter of recommendation for a friend. A greater impact is done when you tell a specific story of how the person was able to overcome a challenge in the office which turned into a successful project. Success stories always make a mark to any recipient! The best recommendations are thorough and specific, and having all the information at hand will make the process much easier. You put your own reputation on the line when you write a personal recommendation letter. If you feel you do not know the person well enough, or they are somebody you cannot in good conscience recommend, recommend decline their request. Get to know more about a personal recommendation letter. Get enlightened through going through our tips and get it straight. Personal Recommendation Letter Editing. Do you have a draft on hand for your personal letter of recommendation? If you are stuck with the writer’s block and cannot seem to continue, let us help you with that. We are offering affordable rates for a single page. Writing a Personal Letter of Recommendation. If you are unsure where to start with the recommendation letter, contact us and we will handle the personal recommendation letter from start to finish. Just send us the relevant details and we will do the job for you. All our writers have years of comprehensive writing experience with a relevant degree under their belts. We want the very best for you and your loved ones and we guarantee that our personal letter of recommendation will be free from errors, highlight the person’s strengths and will leave a lasting impression on the recipient. Click the Order Now button and help put a big smile on somebody’s face! Get our professionals to create an outstanding personal letter of recommendation for you!